(Above) A more modern day attempt at defying gravity. 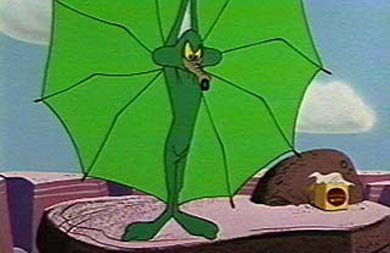 Using wings supplied by ACME, the attempts by Wile E Coyote always resulted in failure. THIS FILM, MADE IN 1912 IN PARIS, depicts the first (and last) attempt to fly by a Frenchman named Franz Reichelt. 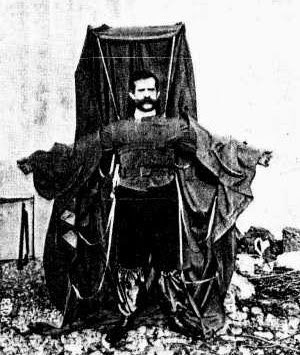 Reichelt (c. 1870s - February 4, 1912), was known by the locals as the flying tailor. He used his skills as a tailor to create an overcoat that he was sure would allow him to fly, glide or float to the ground without harm. He demonstrated his invention with his infamous first and only jump of 60 meters from the first deck of the Eiffel Tower—at that time (1912) the tallest man-made structure in the world. The “flying coat” was a complete disaster, and Reichelt fell like a sack of rocks to his death. Fortunately, the jump was captured on film of the day— showing his death and the hole his body made in the ground upon impact. In the film, you can see him standing on the edge of the tower... contemplating and building up his nerve to jump. Then, he goes for it. Only Wile E Coyote did similar things and lived to try again another day.